Sixty graduates from the University of Stirling’s partnership with Muscat College have received their degree certificates. Professor John Gardner, Senior Deputy Principal of the University of Stirling, joined Muscat College Founder and Chairman, His Excellency Sheikh Dr Ahmed Abdullah Al-Ghazali, at the ceremony in Oman on Tuesday evening (10 November). Graduates have completed honours degrees in: Accountancy and Business Studies; Accountancy and Computing Science; Business Studies; and Business Computing. A fifth BSc honours degree in Computing Science was introduced in 2014 and a new postgraduate programme is currently under development. There are currently 393 students at the capital city campus studying for Stirling degrees. Students have the option to start in first year or complete an SQA HND at the College then move into year three. Lecturers at the College work closely with their Stirling counterparts in the Stirling Management School and School of Natural Sciences to deliver degrees tailored to the needs of the Omani economy. Stirling boasts excellent job credentials, ranked second in Scotland and seventh in the UK for employability, with 96 percent of its graduates in employment or further study within six months of completing their degrees. 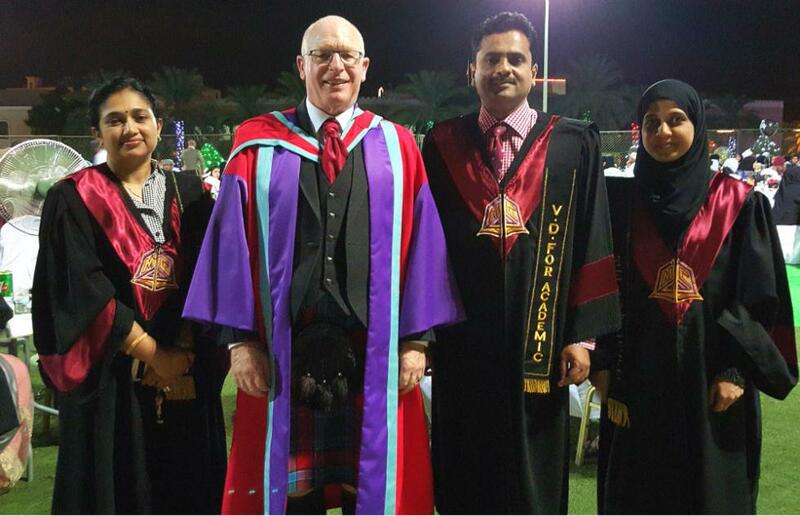 Professor John Gardner, Senior Deputy Principal of the University of Stirling, said: “I would like to extend my congratulations to all our graduates at Muscat College. The knowledge and skills they have gained will enable them to play a key role in shaping Oman’s future. In October, degrees were conferred upon 50 retail graduates at the Singapore Institute of Management Global Education (SIM GE) and last week, the University’s Highlands & Islands Graduation in Inverness recognised the achievements of 90 nursing and healthcare graduates. The final two graduation ceremonies of the year will be held at Stirling’s central campus on Friday 27 November.